This review is for bottle code 1127 and bottling stamp L6332CM000 05394308. Meanwhile it is years ago that I had this once standard Mortlach in my glass, so i opened another bottle out of my stock tonight - simply to check if it is quite as good as I do remember. The nose is heavy Paxarette sherry: nothing more, nothing less. One dimensional, but what a dimension.... Brutal shocking - but if you love this flavor it is great! 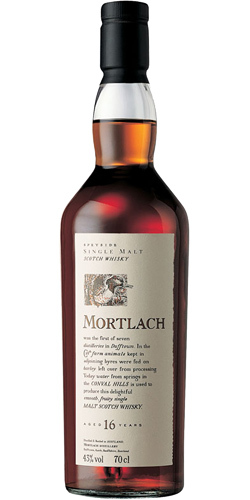 On the palate it gets two-dimensional: Besides the fat sherry you clearly taste the creamy, creme brulee-like signature of the Mortlach malt. There are not many malts that can stand such heavy sherry influence, but Mortlach can! But the best thing about this dram: It is totally sulphur-free (most recent Mortlachs are spoiled with nasty sulphur notes - do they have no cask management at Mortlach or do they have a blind sulphur spot? By the way: The Scottish whisky sales reps in the Middle and Far East state that sulphur notes are a tradition to the Scotch whisky industry - I call this simply a shameless lie! Why the hell are all the stills and condensers made of expensive copper (that reduces unwanted aromes most prominent sulphur) and not made of much cheaper steel (that does nothing in this respect)??? One of my all time favourite whiskies. A sherried masterpiece. Easy to drink Macallan style sherry, the best F&F so far. 87/88. Big sherry. Malt, citruses, waxy fruits, raisin, milk caramel and spicy oak. Despite the 43% ABV, it's powerful. Sweet and spicy. Malt, sherry, Cointreau, raisin, citruses and green apple. Medium length, sweet, fruity, spicy. Like a glass of oatmeal with brown sugar, maple, and raisins. Almost a cross between Edradour and Macallan. Doesn't take water too well. Sherry, malt, fruits, cinnamon, darkness, solventy. Syrupy. Malt, sherry, raisins, maybe some orange. Long and complex, the best part. Vanilla, cognac oak, chocolate, sharp spices, apples, tobacco.